The "made from scratch" rolls looked average but tasted HEAVENLY! Not like any I've bought at the grocery store, that's for sure. And the cookies...OH the cookies...my family was lucky to try these out because I was hittin' them HARD. I would definitely recommend Spoonful of Comfort! The shipping was fast and when I opened the box it was all packaged so nicely! Anyone seeing this at their doorstep would be excited. There are so many times in our lives when we know someone who could use this kind of comfort. Whether it's a Thinking of You gift, Get Well, Sympathy, a College Care Package, New Baby or even for Corporate gifts, this chicken soup package will be well received!! 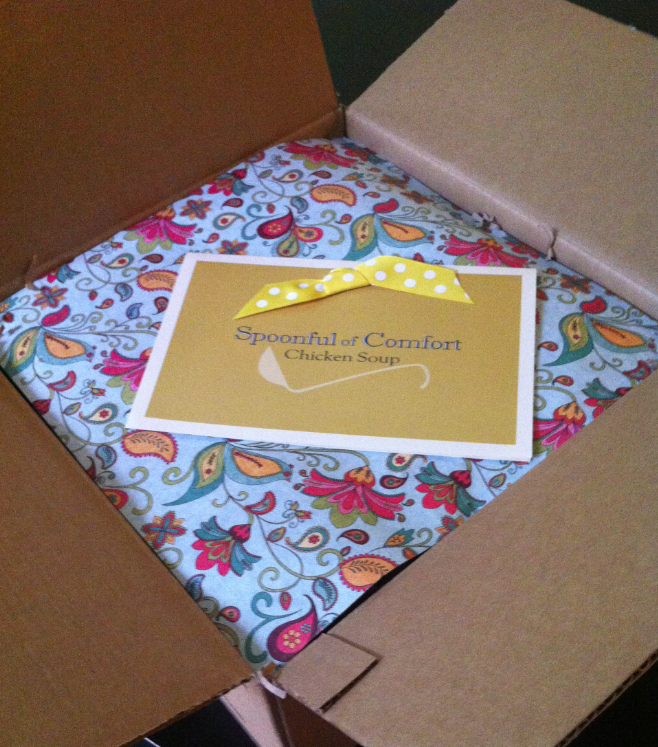 Spoonful of Comfort has a simple ordering process and you can choose different packages with various items. Some of which are a Blanket, Cozy Socks, Soup Ladle, Organic Chamomile Flower Tea and even a comfort pocket stone! Packages range from $24.99 to $79.99. 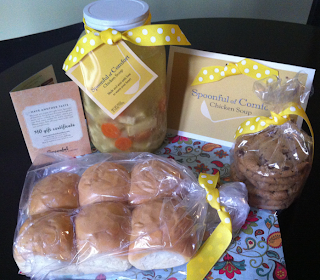 Want to win a Spoonful of Comfort Chicken Soup Package including: Chicken Soup, Homemade rolls, 6 Cookies, and a note card?? OR a Sweet Squeeze Gift Set?? Enter below! 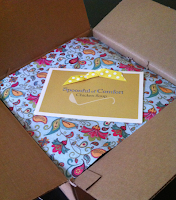 One reader will win a Spoonful of Comfort Chicken Soup Care Package OR a Sweet Squeeze Gift Set!! US only, entries will be verified. a Rafflecopter giveaway Giveaway will end July 31st at 11:59 pm EST. Sponsored by Spoonful of Comfort. I received a care package for review. No other compensation was received. All opinions are my own. This promotion is in no way sponsored, endorsed or administered by, or associated with, Facebook. We hereby release Facebook of any liability. Winner(s) will be contacted by email and will have 48 hours after the giveaway ends to respond before another winner is picked. This would be such a great gift for someone! Thanks for sharing! This is a great giveaway and a great idea for gifts!! Thanks for making us aware of this wonderful company. This is such a great idea for someone who is homebound! What great unique gifts to send to someone. I love it. It would be hard to choose--they both look yummy! Thanks for the chance to win. It looks so yummy! What a great giveaway. Thanks for a chance. And THIS is why I love blogs that do reviews and giveaways...it provides me with information on products that are just this cool! This is a truly amazing giveaway. Good luck everyone and god bless. Ooh, this looks like a great giveaway!!!!! Would love this! Great ideal!! Such a wonderful idea... especially if you know someone who is sick or needs cheering up!!! Thanks for the chance! Thanks. The chicken soups looks yummy! oh my this looks good!! I would love to try the Sweet Squeeze Gift Set. love this giveaways thank you for having it. really like the chicken soup idea. I would really like to order the Sweet Squeeze. Looks yummy! Would love to try the soup! Thank you for the giveaway I would love to try the chicken soup it looks really good. Would Love to win this!! Fingers crossed!!!!! I love soups and pretty much anything homemade. I love to cook from scratch for my family. Would make a great gift. Thank you for an awesome giveaway! I would love this gift package. Thank you for the chance to win such a great gift!! This is a giveaway that I'm very excited about. Love it. Chicken noodle soup is the ultimate of comfort foods!! I love it!! The soup would be a great meal that I wouldn't have to cook after having the baby! I love this company! This is such a unique and great gift for anyone! Love this idea. I would love to get this as a gift. This is such a good idea. I love it. Thanks for the chance to win. I love chicken soup. Thank you. What a great idea! I'd love to receive ANY of the "comfort" baskets! What a wonderful idea. Thanks for the chance to try this out! man i so could use this right now!! Thank you this is great! i would love to win this!!! Thanks so much! I'm always looking for unique ideas and gifts for people. Spoonful of Comfort! Now this is a refreshing way to show someone you care! Both packages look great. 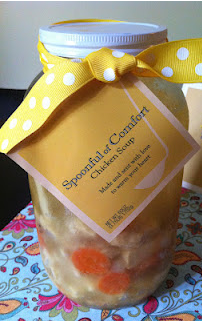 As someone healing from a broken foot right now, the Spoonful of Comfort Chicken Soup Care Package really looks scrumptious. I would love this win this!! Thanks for the chance! That is such a great idea! 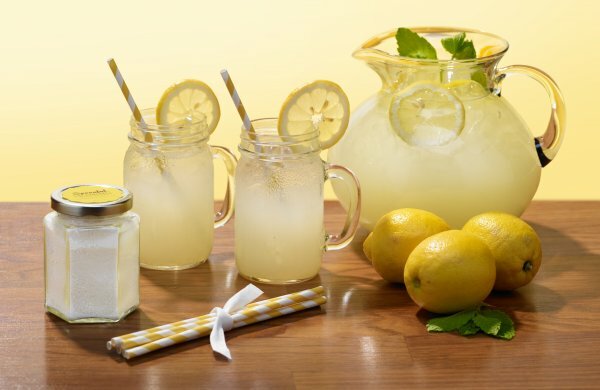 I light of the horribly HOT weather we have here, lemonade and cookies sound great!! Thank You So Much for the great giveaway! I really love it!!! I just love these! Great idea for someone that is sick at home! Thank you so much for offering this as a giveaway! Would love to win this.